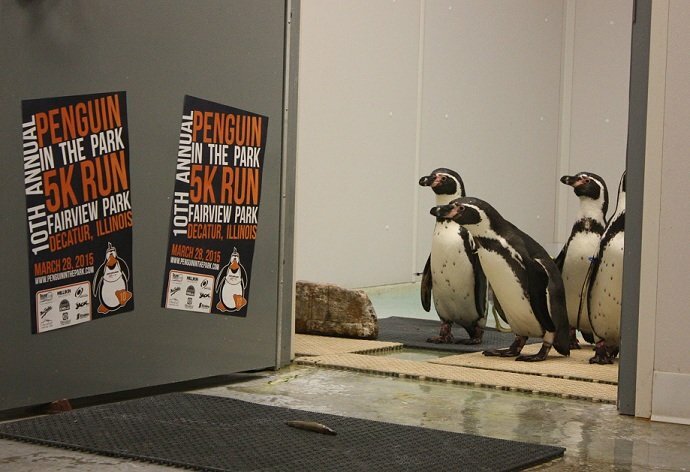 We’re excited to have you participate in the 14th Penguin in the Park 5K on Saturday, March 30. If you haven’t registered yet, there is still time. You can register at Packet Pickup (read below) or prior to the race for $35. The morning should be filled with enthusiasm, a great race course, and fellowship with fellow runners and walkers. This email contains important information about packet pickup and race day, so please read on. ▪ Pick up your race packet on Friday at Staley Credit Union on N. Woodford in Decatur between 11:00 am and 5:00 pm. click here for directions. Participants who pick up their packet on Friday are automatically entered in a drawing for a $25 Visa gift card. ▪ Race packets may also be picked up prior to the race on Saturday between 7:15 am and 8:30 am. We are expecting large turnout this year, so parking will be difficult. We recommend that you park in one of the Millikin parking lots along Fairview Ave (in front of Kirkland Fine Arts Center or next to Westminster Church). Click here for a campus map. This will allow you easy access to both Fairview Park and Griswold Gym for the post-race party with a little warm-up and cool down walk to and from both locations. ▪ Prior to the race, Millikin’s student-run venture Blue Brew, will be on site selling hot drinks to keep you warm and gear you up for the race. ▪ The race is electronically timed by a “chip” that is integrated into your bib number. You must wear your bib on your front across your stomach (and visible). Your bib DOES NOT have to be returned or the tag torn when you cross through the chute and is disposable. Remember, no bib… NO TIME! When you are finished with the race, grab a cup of water and head over to Millikin’s Griswold Center for the post race party where you’ll find food, water provided by Pepsi, pasta, and famous Ray’s Chili. We will also have past Penguin in the Park 5K items for sale in addition to window decals designed and printed by Trump Direct. You may obtain a window decal for a donation into the John Bingham Scholarship Fund. Looking for race results? They’re being streamed online in real time, compliments of It’s Race Time. Are you traveling to Decatur for Penguin in the Park this year? With the assistance of one of our community partners, the Decatur Area Convention and Visitor’s Bureau has secured discounted hotel rates for race weekend. These special rates are valid for Friday and Saturday night. Simply call the hotel of your choice and let them know you are in town for Penguin in the Park. Negotiated rates can be found under our website under Accommodations. It’s a new year and time to look forward to the 11th Penguin in the Park 5K on 3.19.16. Online registration is now open. Come be a part of Macon County’s largest 5K run/walk and see John “The Penguin” Bingham in his only public appearance for the year. We’ve added a 300 meter Tot Trot this year for the youth to get involved in the fun as well. Use the discount code WADDLEON to receive a $2 discount on your registration. Visit penguin5k.com/race-information for all the details. 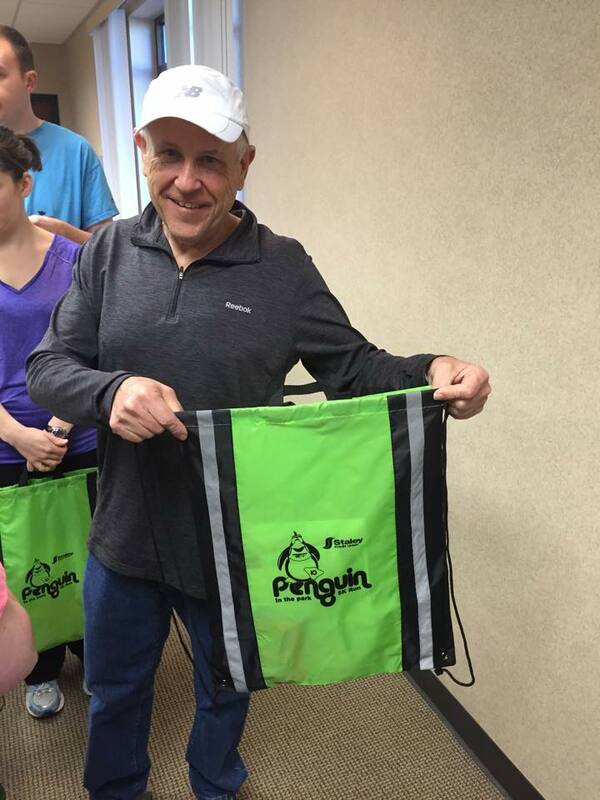 A sneak peak at the race bags the first 1,000 registrants for this year’s Penguin in the Park 5K. Time is running out on the best available rate for Penguin in the Park 5K. On March 1, the registration price increases to $25. These penguins are going to get their registrations in by March 1. Will you? John is Training with You! We’re almost 3 weeks into 2015. Do you need a goal to keep you on track with your fitness goals? Commit to the Penguin in the Park 5K Run/Walk on March 28 to give you some motivation. John Bingham is training to run/walk with you as he attends in the year of his retirement. Register online before March 1 to get the best price on registration with no processing fees. Penguin in the Park 5K Run/Walk will be celebrating its 10th anniversary on March 28, 2015! The Penguin will be making a special return to his alma mater, Millikin University, in Decatur, Illinois since his official retirement announcement for a race that embraces the Penguin in all of us—a race for the speedy, and those who want to take their time and enjoy the course! Starting at 9:00am, the race takes place in Fairview Park on a rolling bike path; afterwards, we move to the post-race party inside to Millikin’s Griswold Gym for awards, warm food, and inspiration from the Penguin.